This is the 2nd time I have been to this restaurant, the first time was with a couple of friends a while back, and I forgot to bring my camera that evening so didn’t take any photos. This time, I made sure I brought it. I came here with Hubby as I have been craving for Japanese food. Most of the Japanese restaurants around Tin Hau are yakitori restaurants, but I wasn’t craving yakitori, I wanted sashimi and sushi! So of course, a serving of sashimi platter was in order. Fresh salmon, tuna, king fish, scallops, prawns arrived. The sashimi platter was fresh, light and absolutely delightful. I didn’t eat any of the prawns though, I am not a huge fan of raw prawns – it’s just a little too slimy for me. Hubby loves ox tongue, so he ordered a serving of that (two sticks). 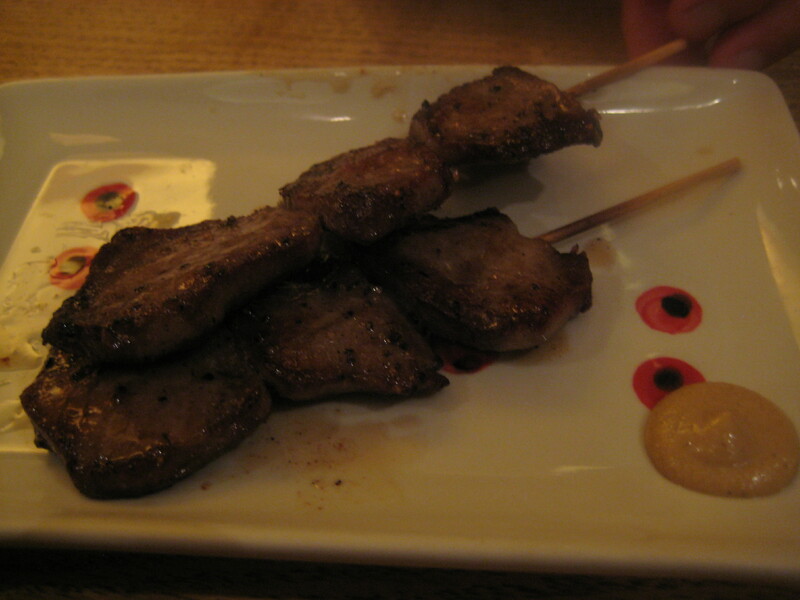 The ox tongue was tender, and extremely flavoursome. It was a little salty for my liking but it was tasty. I love agedashi tofu – soft, tender tofu, slightly deep fried until golden brown, served in a hot tentsuyu broth and topped with finely chopped negi (a type of spring onions), and grated bonito flakes. The tofu was indeed soft and golden brown. However, I thought the broth was a little tasteless. 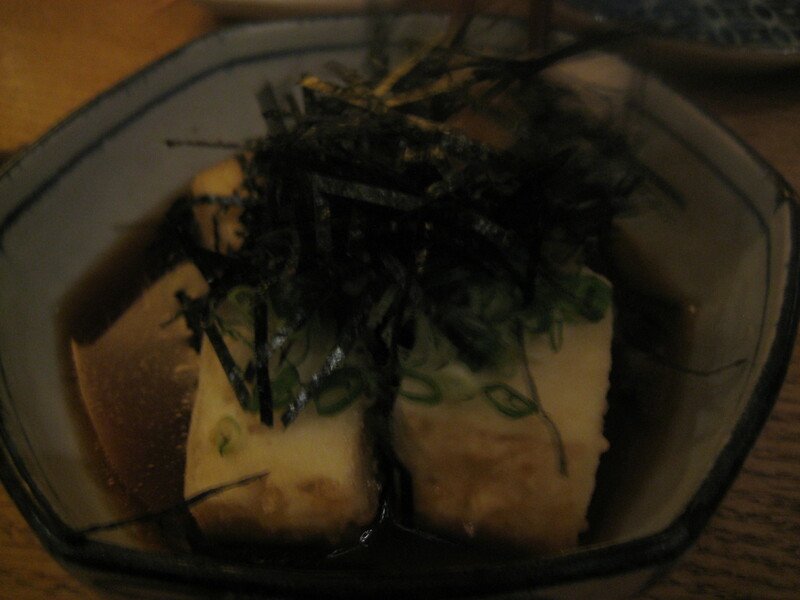 It wasn’t the best agedashi tofu I’ve had, but it certainly wasn’t the worst either. 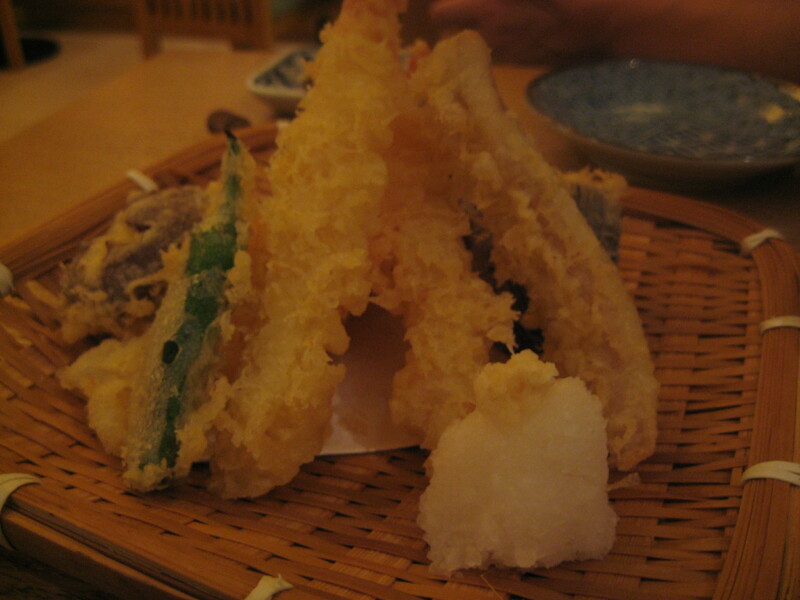 Next came prawn and vegetable tempura, the prawn were fresh and lightly battered. The vegetable tempura which consisted of eggplant, mushroom, sweet potato was fantastic. It was the perfect way to end the meal. 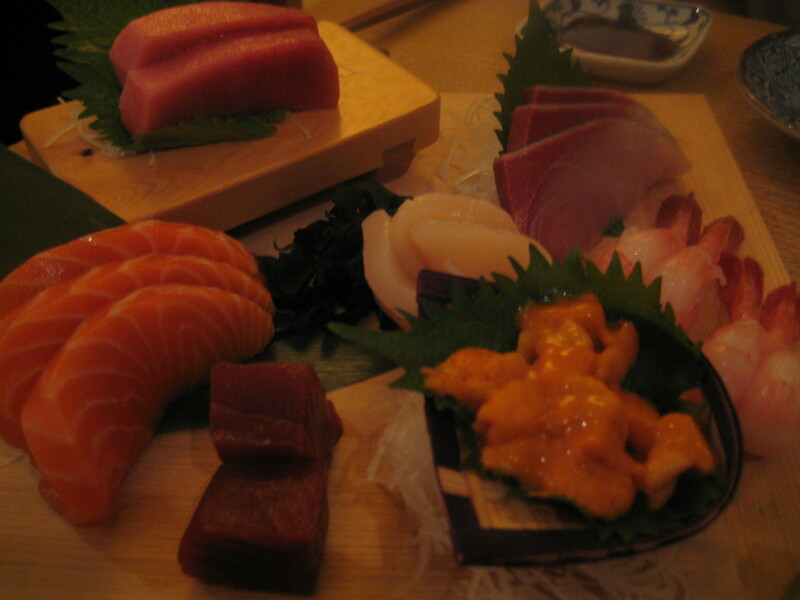 The menu was quite extensive (ranging from fresh sashimi, to cooked eel and tempura to yakitori) and fresh. The meal we had was delicious, but I don’t think it was anything special or anything to rave out. It was quite simple but definitely satisfied my sashimi cravings!